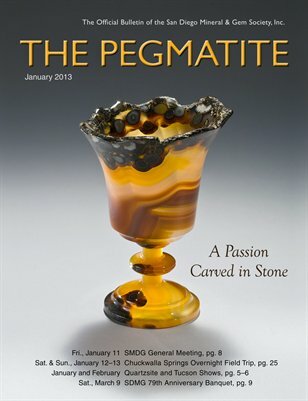 Feature articles include "A Private Passion Carved in Stone," by Lisbet Thoresen and "Iris Agates from Oscar U. Zerk’s Natural History Museum," by Shou-Lin Lee. Also included: Field Trip news on Chuckwalla Springs and Q.I.A. Pow_wow; a calendar of shows in Quartzsite and Tucson; club news, school news and class schedule; as well as Gemological Society of San Diego meeting agenda and news.